Living in a country that has been devastated by bitter war for more than thirty years is difficult. Children are killed by suicide attacks or roadside bombs, or sometimes burnt by acid on their way to school. Before I came to the United States last year with my family as refugees, I lived in Herat Province, where I witnessed girls poisoned at school, along with many kidnappings. Some day I wish to go back to Afghanistan to help women and girls, but I don’t know when, or if, it will be possible. Every day in Afghanistan, people walk with fear and think death is following them. When suicide attacks occur, hearts collapse and breathing becomes difficult. Everyone cries for family or friends. Four years ago, one of my classmates lost her brother, a second-year student in college studying agriculture, to a suicide attack. “He was so young,” she told me. “My mother cannot yet believe that she lost her son, and she will not let us to touch his property. She locked his room and she always tells us that her son will come back one day.” Once my mother was on a bus with the mother of the young man, and the mother began crying when they passed his university. It is natural that some people want to escape this situation. But sometimes they put themselves in even greater danger when they leave. I watched a video on the news and also on YouTube showing people crying near the Ionian Sea. They also were from Herat and had fled to Iran and Turkey. They wanted to cross the Ionian Sea. A neighbor was in the video. Often people put themselves in danger by going to another country illegally. When my uncle came back he told me how he was crossing the Iran border with a family with three kids but their father could not walk well. At the border, police began shooting, so he and the man’s wife helped the children run and a bullet barely missed his head. Other people hire a racketeer to guide them to walk to Europe or take a small boat and drown in the sea on the way. Some who reach their destination safely are still deported back to Afghanistan, but often they sold all their property before they left and they arrive in their home country with nothing. Some can start over, but others are not able to. My uncle also left Afghanistan for Germany, but came back four years ago after deciding that he wanted to stay to develop his homeland. He teaches at a university. But it is dangerous for him. A few weeks ago, his friend was killed in the middle of the day in the center of the city for no reasons we know. He is sad about the death and worried about the lack of security, but he is working for a peaceful Afghanistan for the new generation. I wish Afghanistan was without war, discrimination, violence, suicide attacks, or killing. I wish everyone lived in peace and nobody wanted to flee. But every day the situation forces more people to leave, and some to endanger their lives in the act of leaving. I hope a day will come where everyone lives in peace and safety. The author now lives in the U.S. This piece has also been published in partnership with Women’s eNews Teen Voices. Photo by Simon Monk. This is a sad but important essay that details the choices that so many Afghan people make, risking all for a new life. So heartbreaking to read about the man who lost all but one son. And, there are so many others just like him, who have lost everything. I echo your hope that one day there will be peace and safety and no one will have to flee. Thank you for writing this. DEar Zahra W. I was so touched by your writing. I am so sorry that you children can not have normal happy childhood, instead you see violence and blood. I am so sorry for that. I also wish that in Afghanistan finally come peace and secure life. But we all need in God, prayers and children like you Zahra jan, should try to make our world better. I was so touched by writings of you. and tears filling my eyes. ((( Wish you good luck in your mission. my name is Delangiz G.
This was a moving piece and I am truly upset over how hard it must be to live in Afghanistan at the moment and to not know what the best choice is for the future. I’m from Iran and my parents grew up during a war too so I have heard many stories about their hardships of overcoming it all. There is still hope for your people, and if anything, the war makes you stronger. The situations that you have been placed in have led to you appreciating life so much more. I hope your people and country gains peace and that one day it will always be safe for everyone. Dear Zahra, It makes my heart broke to read this article because the situation you described: these terrible things happened in Afghan and the people suffered. In this situation, no one knows what is the right choice, to leave or stay. But I strongly believe that one day those terrible things will be gone, you, the Afghanistan, and the country will have a bright future. Someday all the hard works Afghanistan did, such as your uncle, will contribute the society, give hope to the next generation. I hope someday you will live in a peace and modern country, live a happy life. Thank you for sharing your insights on a terrible issue on right now. It’s really sad to see how people are abusing one another. It’s quite heart-breaking to see people to be in danger in their own communities. The next thing they know they can be assassinated for no reason, like you’re father’s friend. Sadly, I don’t see the situation changing anytime soon. I feel upset when I read your essay. I don’t see the bright future for this country. People who are educated want to build better life for others, so they come back to their country even though that is dangerous. However, they don’t have the good conditions to do that. The war always threat people’s life in this bad situation. I hope the current situation will change as soon as possible, and Afghan citizens will enjoy better life instead of war. I am really moved by your piece. It showed me how hard it is to live in Afghanistan at this very moment because there are many life-changing decisions that you have to make. I have some family in Iran and they all tell me how hard life is over there. They describe the difficulties every person goes through. I am really sorry that you are going through all of this, and hopefully everything will become better soon. You are a strong young woman for being able to share your thoughts. I hope your country will soon find peace and that you stay safe. Reading about all the pain and suffering you are going through makes my heart heart as I am also 15. This story helped put into perspective the privilege I have of living in a developed country. Despite the current state of Afghanistan, optimism is essential. Just know your voice is being heard. That itself is enough to create discourse in order to garner international attention. I not only wish the best of luck for you, but also for your country. I hope Afghanistan becomes a safe space for everyone, included women. The world needs people like you: strong, brilliant, and inspirational. Reading your piece I realize how much suffering women have to go through in that type of society. It shows how much people oppress women to deprive them of what should be granted to everyone, such as education. This really puts into perspective how much danger women endure day to day. It is amazing how much women are determined to still go to school even after these dangers. This shows how much women are dedicated to being educated. It shows that because of these really extremist beliefs they think that they are justified in kidnapping, and poisoning women and girls. 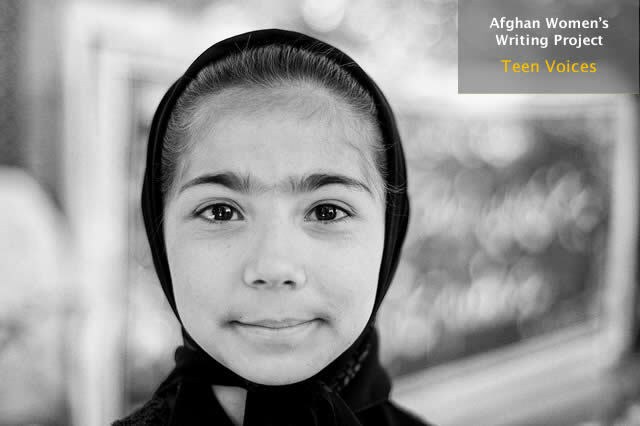 I hope soon Afghanistan will have an equal society and women and girls can live in peace. Unfortunately our world is plagued with violence and misery. Worse enough, the middle east seems to be the greatest victim of this. I remember when my family members would tell me about stories when they were children in Iran during the Iran-Iraq War and during the Revolutionary period. I remember when my mom told me she was a child running through the streets as a rain of bullets would fly past her as she would try to bring her neighbors water. When my uncle would tell me of just a casual walk in the stress and rockets would fly over their hits and collapse the buildings near them. This is not a world people need to live in. For those bravehearted few who endure this, they have seen the worst yet can bring change to this world. This article makes my heart feel so sad. I was very hesitant about writing because I am not good at English. But I write since I want to comfort you in your pain. You’ll be able to go to Afghanistan and help many women. And I hope you are happy. I truly am sorry for the experiences you have to go through on a daily basis, that you cannot have a normal childhood of running and playing with little to worry about. My dad growing up in Afghanistan faced many of the same things, so although I myself have never been there my dad’s story are similar to your experiences. He and his family fled from Kabul when he was just 7 years old crossing the border and flying to Germany. Thankfully he reached the United States of America safely, but he recalls friends and neighbors being shot, men with guns on his rooftop, and soldiers dead bodies around him while they fled. I truly am sorry for what happens for my father was fortunate enough to flee and survive but I pray that one day children such as yourself will have a childhood and will be able to run and play with little worries. Your writing is powerful and truth is seen in it all the hardships that both parents and children face on a day-to-day basis. I like you hope that one day there will be peace and safety that instead of fleeing people will come back, will smile, that woman and children will be happy and safe, family’s together with no fear of death, and everyone will enjoy Afghanistan for how it should be. Thank you for sharing your experiences. Your essay really brings to light the incredibly difficult, heart-wrenching lives of Afghan-citizens attempting at a better life. It is so unfair having to live in constant fear of what tomorrow holds. You are incredibly fortunate to be able to have escaped the terror of what is going on in your home country, and it is awesome that you are taking action to bring awareness to the current situation through your writing. I understand your fear of returning to your home country, and that is very sad, but it is important to keep a positive outlook and have hope for the people who are not able to free themselves from this incessant fear of death. By this essay, I hope that support is gained for the movement towards a safe, equal society where women have the freedom to live on their own and make their own decisions, not living in constant fear of their husbands’ retaliation or bombings which are a result of irrational men with access to weapons. I hope that soon, nobody in Afghanistan will have to live in fear and your essay helps spread the word about the injustice of this situation, and for that, your voice is being heard. Zahara described the horrible condition of living in her country. People lived with the fear of death as suicide bombs and other attacks occur from day to day. She used the case of her friend’s family as an example to show the trauma the attacks have left for mothers of passed away children. Zahara also explains that escaping is not really an option either as it will take many people to greater danger, losing their lives. I was really touched when the neighbor of Zahara’s mother, have lost his family during their attempt to escape, said: “ Now I do not want Europe. I wanted to go there for my family, but now that they are not here, why should I continue?”. I feel sorry for the victims of the situation in Iran, suffering the state of not having any where to go, anything to rely on, and not much of an option in life. I hope one day the situation will improve and Zahara will be able to, as she said, be able to go back and help her country. I feel really sorry to hear about the condition in your motherland, where people have live among constant dangers and try so hard to just survive. When I see you write about people flee from your country and die on their way to other places; the suicidal attack that caused the death of your friend’s brother; the girl who got poisoned at school and your uncle’s miserable lost, I feel unfair for people in your country. I can not imagine if these things happen to me and it is so brave of you to stand out and speak for your country. Fortunately, there is someone like your uncle attempting to change all this. Thank you for sharing your experience, your story is really touching and hopefully it will help more people get to know about Afghan and get many possible help. I hope things get better in your country and one day people can live a normal life. Though I don’t live in Afghan or Europe, I often hear about the news that lots of refugees from Afghan or other middle east countries run away to Europe. They need to give up their all peopers and face great danger when they pass through Mediteranean. After they arrive Europe,some of they can’t get job, some of them are captured and others surfered discrimination a lot. It’s seem super difficult to decide wheather to leave Afghan or not.Your story really brings to light the incredibly difficult, heart-wrenching lives of Afghan-citizens attempting at a better life. You are incredibly fortunate to be able to have escaped the terror of what is going on in your home country, and it is awesome that you are taking action to bring awareness to the current situation through your writing. I hope that one day you can achieve your dream that you can go back to Afghan to help women and girls here and rebuild your mother land. Thank you for writing this essay that illustrates the miserable situation in Afghanistan. It’s just so heartbreaking to see all the sufferings that you have been through, and I feel so sorry for Afghan people who have experienced or are experiencing all these hardships. I especially feel sad when reading the story of your mother’s neighbor, who lost his family during their attempt to flee. It really makes me realize that Afghan people were driven into a corner, and they have little opportunity of making their life better. I really hope that the situation in Afghanistan will get better and people will no longer suffer from violence and tribulation. Thank you for sharing and hope Afghanistan will get rid off war, discrimination, violence, suicide attacks, or killing. It is pretty sad to hear all these stories that I haven’t heard before and I am super impressed. I have never imagined that there is life like this and really wish you could have a better life. I’ve really impressed by your uncle in the story since it is really magnificent to put oneself in dangerous in order to improve one’s own country. this is such a sad article that makes my heart broken. It’s so tough for the kids and women to live in a country that has wars. Like the story you told, the mom can’t get over the death of his young son. Even it’s already past for years, she still believes her son will come back on e day. Every time she saw the things that can related to the kids, she will cry. This is so unfair for her. The bad things will cover her for the whole life. You are so brave to stand out and say that someday you want to go back to Afghanistan to help women and girls. I really hope that one day in the future, all the wars will disappear from the world even though I know it’s hard to come true. Finally, thanks for your writing and hope the wars in Afghanistan will end and all the things will get better. I am thanking you for sharing a piece of your life that might have not been so easy to tell. I was moved by your explanation of the matter of whether to stay or to leave and it shows clearly the danger in both choices. I thought when I saw the title that leaving would be the obvious choice to make tho by your words that showed me how it is also dangerous to leave and the good reasons present to staying. I believe that it is possible to, by time, improve the social and physical problems in Afghanistan and it shows great courage and braveness to stay or go. I am grateful that you were able to write despite your sadness and you helped me, and I am sure, loads of others to understand and see the world in a different way. I thank you for sharing these experiences. I cannot imagine how difficult and scary it is to live in these conditions, especially because the stories you recounted are all from people you know. I would have expected that in those situations that more people would have taken the risk to leave, but I now understand how dangerous both staying and leaving are. I am grateful to read this and be able to see you writing about this struggle you have witnessed and experienced first hand, and I hope more people from around the world are able to read this and understand the bravery it takes to persevere. I am glad you could share your experience and stories with everyone on this website. I have many Afghan friends who have fathers or uncles who have experienced similar dangers of Afghanistan, so I have heard about other frightening experiences. While it is now a very dangerous and hurtful place, I too hope that there will someday be peace and safety for all who I’ve there. It hurts to hear about so many people who have lost so much, however, it is very important that their stories are shared and heard and for that, you are to be thanked. Thank you for being brave enough to tell people about these stories. Dear Zahra, I feel so sorry of all the hardship that you and your family have to go through, and i really appreciate for sharing the these story. After reading your story I realize how much people suffer in a country that full of violence. I felt so bad that when you describe the situation that how the trauma the attacks have left for moms of passes away children, and how escaping is not really an option that will sometime cause to lose their lives. I was so touching that even people knew how bad the consequence and the situation will be and they still choose to stay, and others have the courage to leave the place that they grew up. I really hope that one day the country will be peaceful and wealthier.